La nostra luce, luminosa, spaziosa e confortevole, due camere da letto, due bagni Poipu Beach di fronte all'oceano affitto condo siede 40 piedi dal bordo dell'oceano. Le vetrate a tutta altezza offrono viste panoramiche sull'oceano senza ostacoli. Puoi vedere tramonti spettacolari, tartarughe marine giganti, delfini e balene dal comfort del nostro soggiorno e del lanai. I suoni dell'oceano sono rilassanti - una colonna sonora perfetta per questo paradiso. Cammina a soli 100 piedi per raggiungere una delle spiagge più famose al mondo per prendere il sole, fare snorkeling, boogie board e sonnecchiare. Travel Channel classifica la spiaggia di fronte a questo condominio come una delle migliori spiagge degli Stati Uniti e Sunset Magazine lo descrive come il miglior nuoto e snorkeling in tutto Kauai. Una vacanza alle Hawaii non diventa più bella. Nuova aria condizionata installata nella zona giorno principale e nella camera da letto principale. Just can’t beat the view from this unit. Saw humpback whales, dolphins and turtles from the lanai. Very nice Kuhio Shores Unit 315. All amenities were great and location perfect. We loved the condo. We had a spectacular ocean view. We saw turtles, dolphins, and surfers from our lanai. We were a little early for whales, but I know we would have seen them also. The condo was wonderful. It was very clean, comfortable, great location, and had everything we needed for our stay. We definitely will be back. It was our first time to Kauai and we loved it. This is a gorgeous condo that really does look right out over the shore and sea as promised in the pictures. From sunrise to sunset, surfers were on the waves for our viewing entertainment, but we also saw whales breaching and a sea turtle seems to hang out just at the edge of the shore. Right next door is a delicious restaurant. In the same building as the restaurant you can rent snorkeling gear and enter the water just off the edge of the path. Snorkeling is like swimming in an aquarium and incredibly entertaining.The condo itself is comfortable with all the promised amenities. The master and main rooms have a/c, but to be honest, we didn't need it when we were there. (End of April) The winds keep things cool enough if you just leave the screens open. To get around easily in Kauai it helps to rent a car, but on bike you could get to the famous blow hole (Spouting horn--2 miles, you could walk it also) or Koala landing which is also good for snorkeling but has no beach area. Hardier bikers, can of course get much further. There is a shopping center/complex within walking distance (about 15 min) which has several nice restaurants there also, plus a farmers market and other things going on (art, car shows). It was pure luck that we chose to rent on this end of the island. The other coasts were closed off with brown water warnings, although the eastern side was intermittently opening while we were there. Enjoy! Would stay here again if we have the chance to return to Kauai. 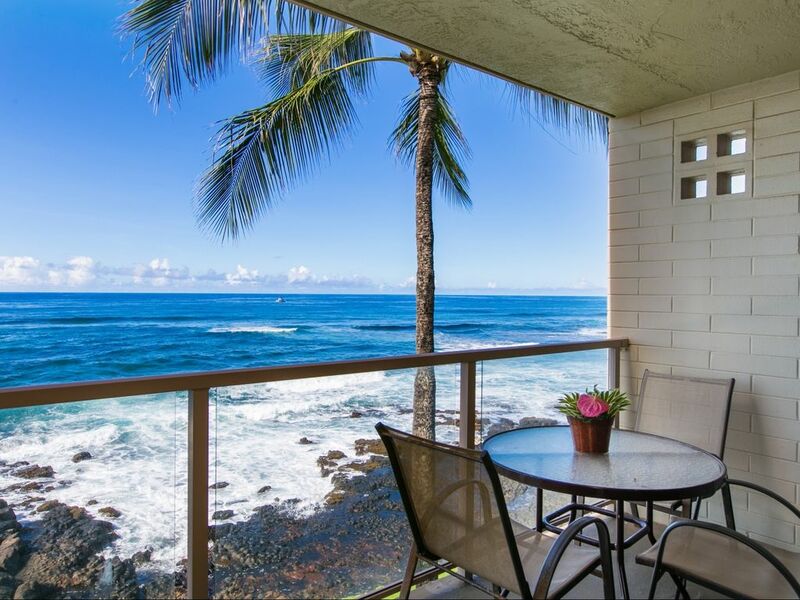 The best about this condo is the balcony right on the Pacific ! Certainly had everything to make our stay comfortable. Lovely area with all the amenities to make our stay very enjoyable. Our only suggestions are adding more 'reading lights' to the living area, moving the small TV to the master bedroom and replacing it with a much larger screen in the living area and much needed glassware. Beach House Restaurant Accanto al nostro condominio offre sistemazioni per matrimoni e altre celebrazioni.